Para leer esta artículo en español, haga clic aquí. West Michigan Hispanic Chamber of Commerce Executive Director Guillermo Cisneros. 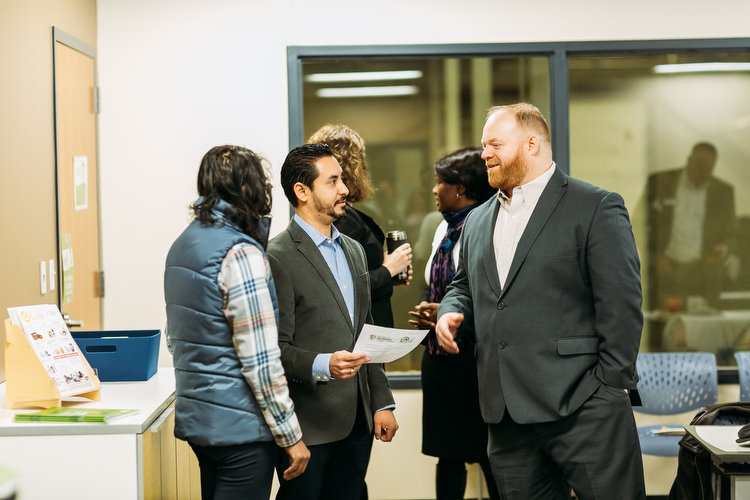 Having personally experienced challenges finding quality employment and getting connected when he moved to Grand Rapids 10 years ago, West Michigan Hispanic Chamber of Commerce Executive Director Guillermo Cisneros is now forging partnerships within West Michigan to help educate and empower the Latinx business community. Recently, a member of the West Michigan Hispanic Chamber of Commerce sought to rent space to operate her food truck in the City, so she went to talk to the manager of the property. He was going to charge her $2,500. She later shared this information with the Chamber. 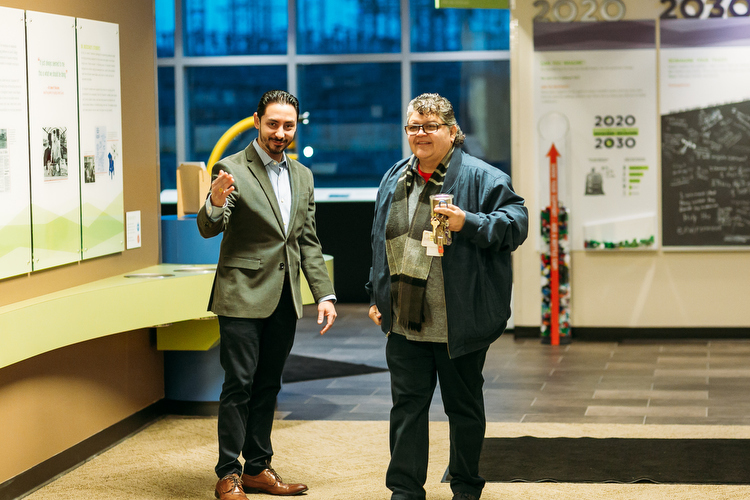 Their Transformando West Michigan program manager, Ana Jose, then went with the business owner to talk to the same person about renting his property. The amount then decreased to $250. This is an experience that was shared by Chamber executive director, Guillermo Cisneros. Unfortunately, it is not the only story of its kind. 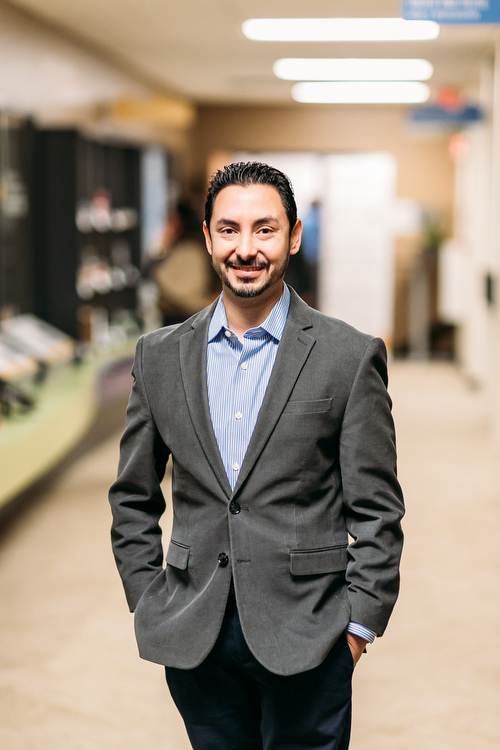 Rapid Growth spoke with Cisneros to learn more about the challenges being faced by the Latinx entrepreneurial community, how the Chamber is working to make a difference, and about some of the other community organizations that are also serving as advocates. Rapid Growth: What does racial equity mean to you? Guillermo Cisneros: Racial equity is being able to have all of our citizens from our community in every place that they want to be part of. It means to give access to every individual, no matter the race [or] ethnicity. RG: What does the Latinx community look like in the Greater Grand Rapids area? GC: Our Latinx community is fairly young. They have been in West Michigan for 100 years; that’s the data that we have. There is a difference between communities from California, Texas, New Mexico — they go back 20 [or] 30 generations. We have two generations in West Michigan. The first generation came as migrant workers, working in agriculture, manufacturing, hospitality. Many of them started their own businesses and are members of the Hispanic Chamber. Having been first generation, [I know that] a high percentage of them don’t speak English or feel more comfortable speaking Spanish. That’s where we have seen abuse happen, mainly in this first generation of Latinxs we have here in West Michigan. The second generation are the children of these individuals that are going to college now. They obviously speak English. Where we see the issues is working with the first generation. Many of these Latinx business owners, first of all, they have a business to take care of. They have a family and sometimes, they don’t have time to learn another language. It’s like asking a 35-year-old to try to learn a different language. It is difficult. RG: What abuses have you seen specifically affecting the Latinx community? GC: For many years, we have been the subject of abuse from certain organizations [and] individuals. I have heard many, many stories about lenders taking advantage of the Latinx community while they’re promoting certain mortgages. One of the main things in these cases was the language barrier. The Latinx community sometimes signs paperwork where they don’t completely understand the verbiage. We have seen many cases of organizations taking advantage of that. The same thing has happened with attorneys, insurance agents, and many types of service providers throughout the community. RG: Tell us a little bit about the Chamber and your role there. GC: The Chamber has over 600 members and has been in existence for 15 years. I started with the Hispanic Chamber in March of 2017 [and] I have several roles. As executive director, I make sure that all of the internal operations go well. I [oversee] two staff right now and we’re incorporating another program manager in February. I am also in charge of finance, marketing, human resources — everything that matters to the operations. I develop partnerships throughout the community to make sure that we have access to the resources that the rest of the community has and we can bring that to our Latinx business community. The relationships that I develop, and the partnerships that we establish, [are] with government, corporations, small-to-medium [sized] businesses, nonprofits, schools, and universities — which is the composition of our membership. RG: What is the Chamber doing to help combat the issues you mentioned? GC: I feel that one of the roles of this organization is advocacy and that’s part of the principles that we’ve had for many years. I am focusing my efforts on [eliminating these things from happening] within our community. One of the things we’re doing as an organization is vetting businesses or organizations we do business [with]. We want to be able to provide our Latinx business community honest business organizations and honest individuals that really [will] be a collaborative partner of our community and [won’t] take advantage of them. RG: What have you seen throughout this vetting process? GC: In the process, we have seen many companies that would offer a specific service for a certain amount of money. When we compare this service with other service providers [and] we get different quotes, we will see the differences [in] the pricing we’re getting. It’s out of control. We’re talking about the same service but we see the different pricing. That’s a little bit disappointing and it’s alarming. What we want to do is advocate for the Latinx community. When we notice companies or organizations that are just looking for money or [to increase] their sales, that tells us that we don’t need to do business with them. RG: What role do you see community organizations playing in changing the dialogue around these disparities? GC: They are huge advocates for our community. They are really good partners because they are identifying the issues. They are investing in the Hispanic Chamber to be able to change the narrative. When we have these corporations or small-to-medium sized businesses [as partners], the financial support that they provide impacts the Latinx community directly and helps us implement new programming with these resources. RG: How have the community partnerships you’ve established aided in the Chamber’s initiatives? GC: One piece is [through] economic development. The other piece is workforce development [and] talent acquisition. With the program Transformando West Michigan, we try to increase economic advancement. We bring different partners throughout West Michigan like Principal Financial, Varnum, Grand Valley State University, Gordon Food Service, and Culinary Cultivations. They bring their knowledge to our community. A new program that we are going to be launching in the next few weeks [has a goal] to build a pipeline between the Latinx college students that we have in West Michigan and the local organizations, eliminating some of the issues many organizations have with talent acquisition. [Additionally], we just started a partnership with Local First and the Literacy Center to provide ESL (English as a Second Language) classes to the Latinx business community. RG: Have you personally experienced any challenges within the community that impacts your work? GC: My process to find a job was very difficult. When I moved to the country, almost 10 years ago, I didn’t have the social capital or network. It was very hard for me to find a job equivalent to what I had in Spain. I pretty much had to start over in my professional career because I didn’t have access to job opportunities. Because of the experience I had, the program that we are creating, Building Bridges Through Education, [aims] to help the Latinx college students be able to access better opportunities — the opportunities that I didn’t have when I came to this country. Sometimes this second generation of Latinxs has not been exposed to the business world, different corporate positions, or different positions within the West Michigan community. What I experienced definitely helped me to think about developing something that prevents that from happening again with a new generation of Latinx students. RG: What is the importance of these conversations outside of the Latinx community? GC: We strongly believe that the composition of the community comes from the white community, the African-American community, the Asian community, and the Latinx community, primarily in West Michigan. If these four communities move forward at the same pace, the entire economy of the region will see the benefits. But if [any] of the communities get behind the others, we won’t see the entire flourishing of the community. In order for all of the citizens of West Michigan to see prosperity, we have to make sure that all of our communities have resources to be able to be successful. Building Bridges is a series focused on the diverse entrepreneurial community within the West Michigan region. Over the next 12 months, the series will highlight the unique problem solvers and change makers who seek to positively impact the growth of the economy and local ecosystem. Building Bridges is supported by Grand Rapids Opportunities for Women (GROW). Leandra Nisbet, Owner of Stingray Advisory Group LLC and Co-Owner of Gold Leaf Designs LLC, has over 14 years of experience in leadership, sales & marketing and graphic design. Through these organizations, she assists businesses with creating strategies for growth and sustainability through: strategic planning, marketing concept development/implementation, risk management solutions and financial organization. She is actively involved in the community, sitting on several Boards and committees, and has been recognized as one of the 40 Under 40 Business Leaders in Grand Rapids. Contact Leandra Nisbet by email at leandra.rapidgrowth@gmail.com! Photos by Chantal Pasag of Pasagraphy.